Feadship’s 96.55m (317′) project Vertigo first departed from its construction hall in late November and just began its first sea-trials out of Amsterdam. Upon delivery in first quarter 2017 Vertigo will rank in the top five largest yachts the yard has built. According to Feadship, Vertigo has been built with a six stateroom layout to accommodate 12 guests and an additional 26 crew members. The superyacht includes features such as a dedicated helicopter hangar and landing pad which will host a Bell 429 helicopter and a 9m swimming pool made of glass panels. 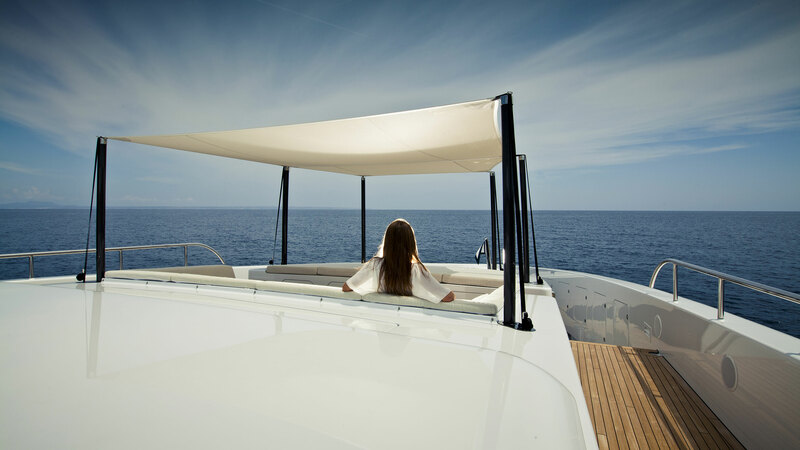 Feadship says the creation of such a swimming pool required laminating five layers of clear glass interspersed with foil to create a final thickness of 68 millimeters. Vertigo’s exterior styling was created by Redman Whiteley & Dixon while the interior work was a collaboration between Redman Whiteley & Dixon and Chahan Interior Design. The steel hull is powered by twin MTU 16V4000 M63L engines and carries 60,000 liters of water in addition to 220,000 liters of fuel. At 12 knots it will have a transoceanic cruising range in excess 5,000 nautical miles and a top speed of 17 knots. Vertigo will also feature two custom tenders in addition to an array of wave runners to transport guests to and from the yacht.